The Australian government has blocked the sale of a massive private cattle ranch to foreign buyers, saying it was "contrary to the national interest." A number of Chinese buyers were reportedly jockeying to buy the property, which is comprised of farming assets stretched across more than 100,000 square kilometers of Australia's vast interior. The land is home to about 185,000 cattle. It's slightly smaller than Ohio, but bigger than Maine. 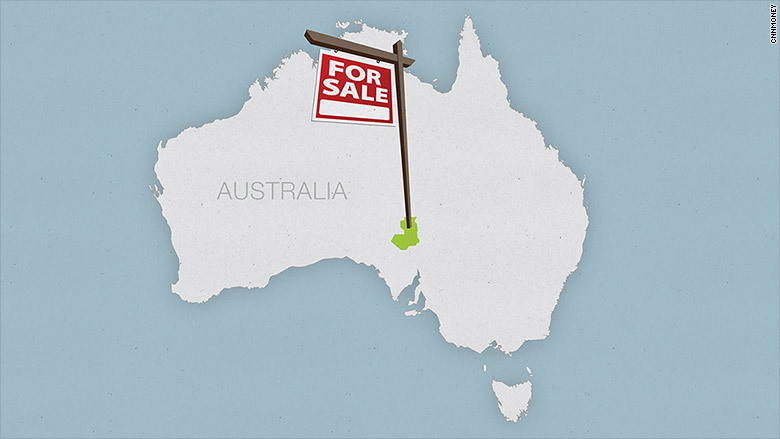 The sale price was pegged around $300 million Australian dollars ($215 million U.S. dollars). Foreign ownership of agricultural land, particularly by the Chinese, is a contentious topic in Australia. On top of that, some of the property was near a weapons testing site. "It is not unusual for governments to restrict access to sensitive areas on national security grounds," the government said in a statement. EY's Adelaide managing partner Don Manifold had been handling the deal and previously told CNNMoney that more than 30 serious buyers had expressed interest. Manifold told CNNMoney the ranch offers a chance to become "one of the world's foremost beef producers," as Asia's growing middle class spurs demand for red meat. The seller will now have to come up with a new plan to sell the property, which could involve finding an Aussie buyer or splitting up the land and selling it in pieces. Australia is the world's third largest beef exporter behind India and Brazil, and ahead of the U.S. Its export strength is helped by a number of free trade agreements with beef-eating countries and its reputation for selling safe meat.